I must say that I have only recently started working with tools such as tidyr or tidyverse, which are really making a revolution in the way one uses R to analyze data. Like all my students until now, I have learned, and I am still learning, R almost all by myself, with no formal training. The good news is that students in our department are about to have this oppotunity thanks to Dr Natalie Nelson who just joined us. In particular, I wanted to make my data tidy so that I could start using ggplot for some of my analyses. I could tell that much of the trick was in the ability to use the gather() and the spread() features of the tidyr package. I have spent countless hours trying to decipher and reproduce the examples in the book, or on tutorials on the web, but I just could find things that would work for me. I slowly realized that all the examples given always use either gather or spread, but using both together is not something well reported, or at least I missed that. I will thus report how I managed to solve my problems here. I have worked for quite a few years on calculating uncertainties on nutrient loads at the catchment scale1–8, but there are many angles one can approach this problem. Recently, I have decided to illustrate minimum water quality improvement reauired for us to be confident that they are real, and that as a function of the sampling frequency. For that, I have written routines that take reference flow and concentration data collected hourly. To simulate water quality (WQ) improvements, I multiply concentrations by 0.99, for a 1% WQ improvement, 0.98 for a 2% WQ improvement, etc. I then degrade the original and the WQ–improved data to simulate common sampling frequency, such as monthly sampling, and compare whether the concentrations from the original and the WQ–improved data are significantly different. I do that for water quality improvements from 1 to 60%, and I look for, for example monthly sampling, the minimum level of WQ improvement required for which I can confidently say (95% confident) that the original and the WQ–improved data are different. 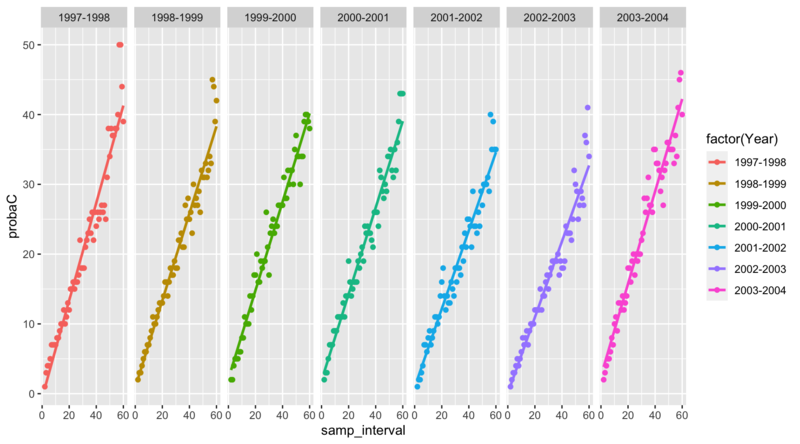 My goal is to be able to plot the minimum WQ improvement required as a function of sampling intervals for all the years available, and see the type of relationship that may exist between the two. 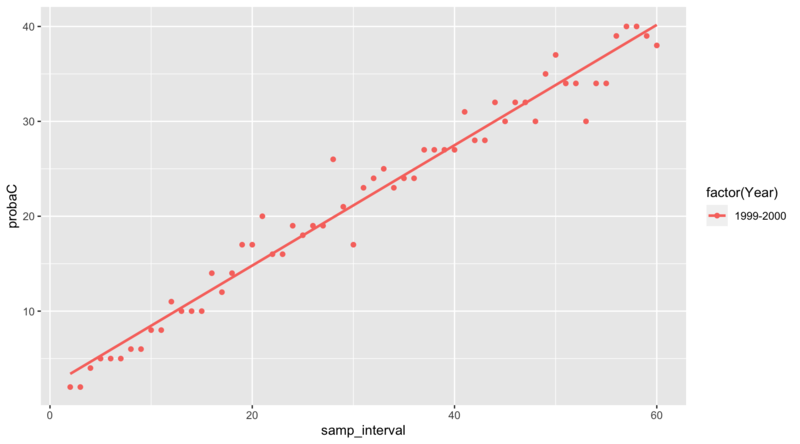 In the version of the detect dataframe, the data are in rows, but for ggplot, I need to put them into columns. The first step is to use the gather function. The part that was extremely unclear to me was the syntax for the gather function. In particular, I could not find that one might want to create new variable names. I want to put all the columns X02d to X60d as row-variables, so they need to be in lines now. First, I need to create a new column-variable, in which all the sampling interval names X02d to X60d will be stored. I have called it Interval. Second, I need to store all the values corresponding to all sampling intervals into another column-variable, and I need to provide a name for it. I have chosen value. This is where most posts stop when I “googled” gather() and tidyr, but clearly the data is just not in a usable form, yet. The good news is that the 59 columns are now spread into rows, but I still cannot plot probaC as a function of samp_interval. This is where It finally dawned on me that I could spread the data stored in rows in the column type, and make them become columns. This is where the spread() functions comes in. In that function, you define origin column you want to spread into several column-variables, which names will become the unique items from the origin column. In my case here, I want the three unique values in type to become columns, and I want that the correponding values (stored into the column value, I know it is not the best name), be assigned to these new columns. The code to do this is below. So now, I have columns for the sampling intervals (samp_interval) and the simulated values stored in probaC and probaL. The power of ggplot can now be used to plot the relationship between the minimum concentration difference required to be detected, per year. The purpose of this blog post is to display the use of an R code and tricks that I find important to share, but I have to admit that it would be a bit frustrating not to comment the results at all. I have asked ggplot to fit the data with a linear model, and I must say that it is probably not the very best model, as clearly the model would tend to overestimate the minimum WQ improvements required for them to be detected, for weekly or better sampling frequencies. But otherwise, the linear model is probably a pretty good first approach. Depending on the years, the results suggest that for a monthly sampling scheme to confidently detect a WQ improvement, improvement would have to be at least around 20%. In other words, for this watershed, and for nitrate, the results show that if water quality would improve by 10% (which is not insignificant), monthly sampling would not be able to confidently detect it…! Think about all false negative that have been reported…! This is one of the reasons why our team has invested in sensors! 1. Moatar, F., Meybeck, M., Raymond, S., Birgand, F. & Curie, F. River flux uncertainties predicted by hydrological variability and riverine material behaviour. Hydrol. Process. 27, 3535–3546 (2013). 2. Birgand, F., Lellouche, G. & Appelboom, T. W. Measuring flow in non-ideal conditions for short-term projects: Uncertainties associated with the use of stage-discharge rating curves. J. Hydrol. 503, 186–195 (2013). 3. Birgand, F., Appelboom, T. W., Chescheir, G. M. & Skaggs, R. W. Estimating nitrogen, phosphorus, and carbon fluxes in forested and mixed-used watersheds of the lower coastal plain of north carolina: Uncertainties associated with infrequent sampling. Trans. ASABE 54, 2099–2110 (2011). 4. Birgand, F., Faucheux, C., Gruau, G., Moatar, F. & Meybeck, M. Uncertainties in assessing annual nitrate loads and concentration indicators: Part 2. deriving sampling frequency charts in brittany, france. Trans. ASABE 54, 93–104 (2011). 5. Birgand, F. et al. Uncertainties in assessing annual nitrate loads and concentration indicators: Part 1. impact of sampling frequency and load estimation algorithms. Trans. ASABE 53, 437–446 (2010). 6. Birgand, F. et al. Une approche quantitative du rôle de la fréquence d’échantillonnage sur les incertitudes associées aux calculs des flux et des concentrations moyennes en nitrate en bretagne. Ingénieries 59-60, 23–37 (2009). 8. Birgand, F. et al. Mesure des flux et échantillonnage des matières en suspension sur de petits cours d’eau. Ingénieries 40, 21–35 (2004).